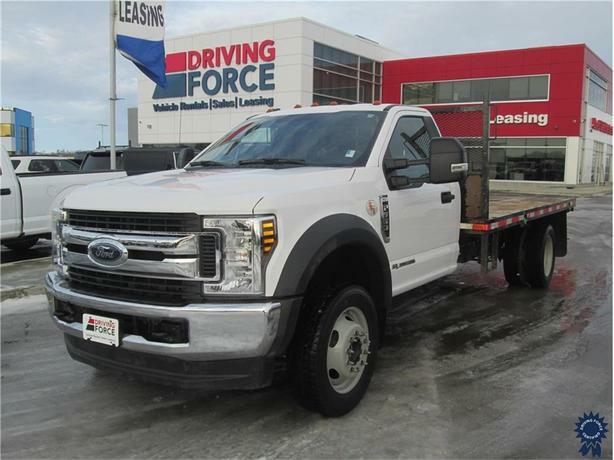 This 2018 Ford F-550 Super Duty XLT Regular Cab 3 Passenger 4X4 DRW 14-Foot Flat Deck Truck comes with a 193-inch wheelbase, 108-inch cab-to-axle, TorqShift 6-speed automatic transmission, limited slip with 4.88 axle ratio, manual transfer case, HD 240-amp alternator, 19.5-inch painted steel wheels, cloth 40/20/40 split bench seat with recline, 4X4 electronic-shift-on-the-fly, trailer brake controller, black platform running boards, 6-ton hydraulic jack, Operator Commanded Regeneration (OCR), exterior backup alarm, upfitter switches, manual locking hubs, front suspension with coil springs, leaf rear suspension with leaf springs, manual extendable trailer style mirrors, black power heated side mirrors with convex spotter, manual folding, and turn signal indicator, cab clearance lights, perimeter/approach lights, cruise control with steering wheel controls, manual air-conditioning, three 12V DC power outlets, power door locks, keyless entry, dual diesel fuel tanks, and GVWR rating of 19,500 lbs (8,845 kgs). The 6.7-litre Power Stroke V8 Turbodiesel engine provides 330 horsepower at 2,600 RPM and 750 lb-ft of torque at 2,000 RPM. Touch base with us to discuss purchasing or financing options that are right for you and experience the difference you will only find at DRIVING FORCE Vehicle Rentals, Sales and Leasing.